Fairly early in my walk along the eastern edge of Lake King William, when I neared the power transmission lines, signs such as the following were posted. I have no idea how close one must be to incur death, and therefore the concept of a ‘near approach’ is rather meaningless. However, because I saw the 4WD track crossing under the power lines from time to time, I guessed that walking along these tracks wouldn’t bring on my early demise, well at least not from electricity jumping about. And so I live to tell tales. Later in the walk when I approached another sign, the combination of the sign and the vista created a special message. 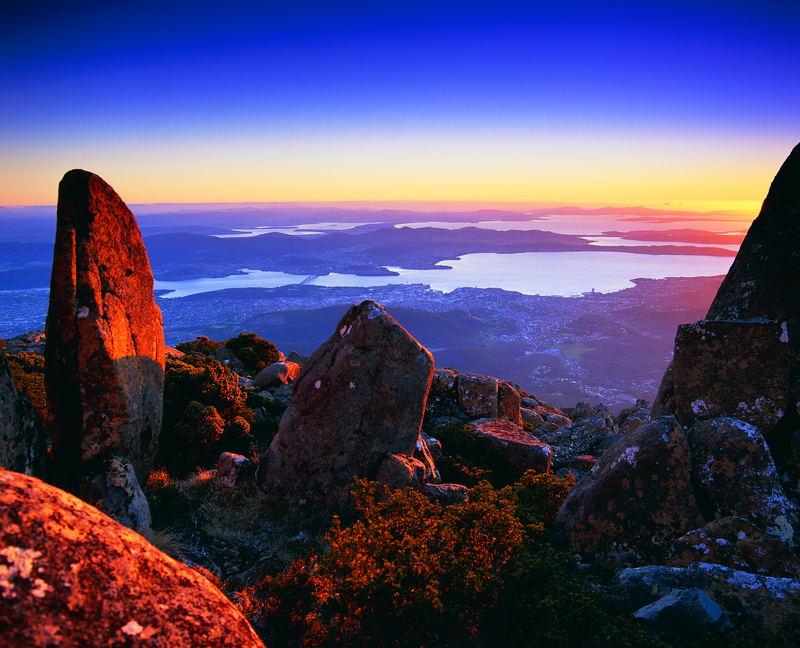 The way my simple mind worked was this: Lake King William is a man-made lake damming the burblings and gurglings of the infant Derwent River. The purpose of the Lake is to enable hydro-electricity power generation. The Lake drowned the native vegetation and dead trees are the result. 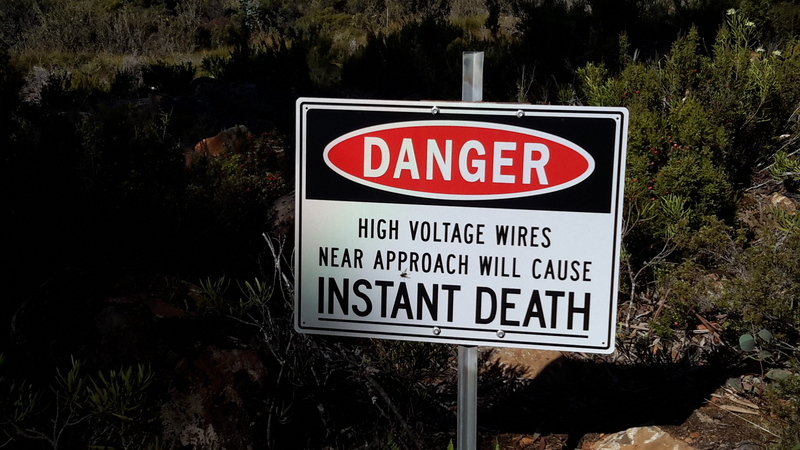 The Danger sign alerts people to the danger of death from the electricity pouring through the wires overhead. The making of electricity kills and electricity itself is a killer. As I walked, I thought a lot about the conservation needs of our forests and our contemporary way of life needs. On the one hand, I can imagine the sorrow and despair that some will have when seeing the photos of the dead remains of old forests jutting out of the land as the Lake’s water level drops. I guess some people would wish this dramatic change to the original landscape never happened. On the other hand, most people want to click lights on at night, recharge their technological devices, and have a refrigerator to keep their food cold and safe, run a washing machine, boil water and cook food. Without electricity (which is always generated using some natural resource), our contemporary lives could not continue. Hydro power is cleaner than coal power, and not dangerous like nuclear power. If we must have electricity, which resource source should we use? The creation of wind turbines changes landscapes and uses large quantities of processed mineral resources. Equipment to support the gathering of solar power also uses processed mineral resources. If we choose to live as we have become accustomed, then ancient forests will be continue to be lost either directly or indirectly. There are very few who would give up the use of anything made from or using electricity. I wonder if it is even possible to do so absolutely in first world and most third world countries. 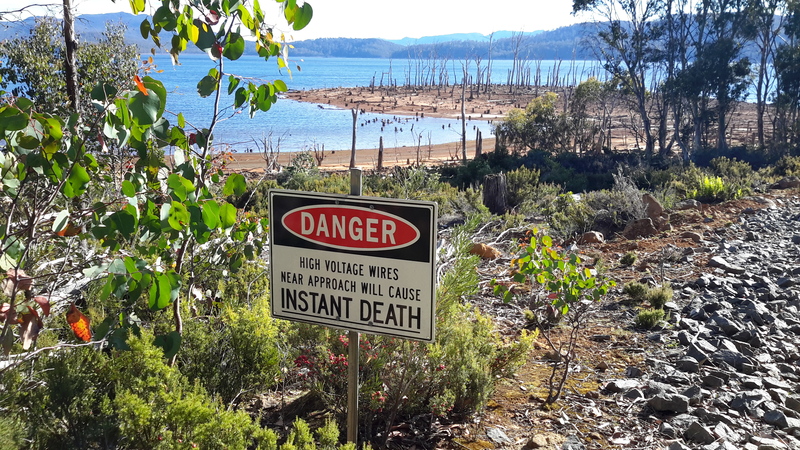 This entry was posted in Derwent River, Tasmania, Walking and tagged danger, electricity, Lake King William, power transmission lines, powerlines, signs on January 15, 2016 by Tasmanian traveller. Very well written, and some excellent food for thought. We do think about the renewable forms of energy such as wind and solar power, which are becoming popular in my area. We tend to overlook that they do use up processed mineral resources. And the solar farms are also on once production agricultural lands that was producing food, but with the solar panels there are no more crops. I do use electricity, try to conserve, but still part of the reason why rivers are damned and farmland is diverted to solar panels. Thanks for your comments. It is great to be out in the bush and have the mental space to think, analyse and evaluate. Depending on the current atmospheric conditions (eg the amount of moisture in the air, etc) electricity will spark across several metres and travel down poles, etc brought close to powerlines. Vehicle antennas might pose a risk as well. That’s good to know.Thank you Mike for that information.